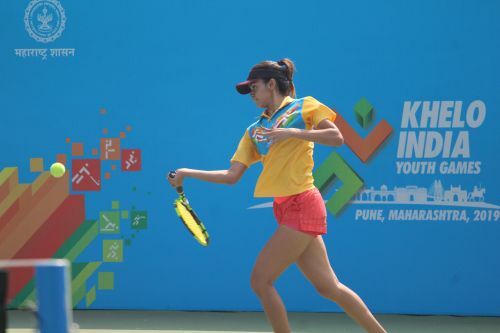 Pune, Jan 15: Second seed Humera Shaik of Telangana was knocked out in the girls Under-21 tennis event by Kaavya Sawhney of Uttar Pradesh at the Shiv Chhatrapati Sports Complex at the Khelo India Youth Games here on Tuesday. Meanwhile, in the boys Under-17 quarter-finals, Maharashtra's Aryaan Bhatia upset top seed Ajay Malik of Haryana 6-4, 6-4. Joining him in the last four was Sushant Dabas of Haryana who beat Kisan Hooda of Chandigarh 3-6, 7-5, 6-2. In the other quarter-finals, Gurustat Makkar of Chandigarh lost to Krish Patel of Gujarat 2-6, 2-6 and the latter will now face Divesh Gahlot of Haryana who defeated Dev Javia of Gujarat 6-4, 6-2. The unseeded Kaavya had lost to Humera three times before in the ITF Juniors, twice in Delhi and once in Chandigarh. But the tennis stadium in Pune's Balewadi turned out to be a lucky venue for her and she was able to put it past Humera by a 6-3, 6-2 scoreline. Kaavya's powerful serve and relentless returning proved too much for Humera, who was broken in the eighth game of the opening set. With a beautiful forehand down the line, Kaavya took the set 6-3 in just 38 minutes. With momentum on her side, the confident Kaavya broke Humera three times in the second set to finish off the match in quick time. The 19-year-old now faces Mihika Yadav of Maharashtra in the semi-finals after the latter routed Kaaviya Balasubramanian of Tamil Nadu 6-0, 6-2. Kaavya said later, "It's a great feeling to be in the semis of KIYG. I’m extremely happy with today's victory as I came just to enjoy the match. I had no expectations as she had beaten me thrice before in ITF Junior tournaments. In the semis too, I'll go without any expectations as it has been working for me." In other quarter-final action, top seed Mahak Jain of Madhya Pradesh was up against Vaidehi Chaudhari of Gujarat. The India number 5 surprising trailed 3-5 in the first set having dropped serve but used all her experience and broke Vaidehi back immediately to restore parity before holding serve and then breaking Vaidehi a second time for the set. Mahak took 24 minutes to win the second set to cruise into the semi-finals by a 7-5, 6-3 margin. She will now meet third seed Zeel Desai of Gujarat who defeated Rashmikaa Bhamidipaty of Telangana 6-1, 6-3. "I was down 3-5 but didn't give it a thought and just focused on my game as that's the only way to make a comeback," Mahak said. Asked about her semi-final against Zeel, Mahak added, “We have played several times, and we know each other's game very well. Although I had the better of her recently, it’s in the past now. I'm looking forward to the clash." Added Zeel, "Ever since I've been with coach Todd Clarke of Australia, it has changed my game drastically. I'm winning long rally points and my anticipation has also improved."